Like the tip of an iceberg, violence is what you see. The causes are much deeper. To prevent violence, there’s not one simple solution. We must act at all levels to address the range of factors that put people at risk for violence or protect them from experiencing or perpetrating violence. Our projects begin by positively influencing events happening now. These are prevention strategies in schools and neighborhoods that address the social and physical environments that are associated with becoming victims or perpetrators of violence. Driving Success: A critical number of West End residents are unemployed or underemployed due to transportation problems. Too many employers have unfilled jobs because good workers can’t get to them. The Driving Success mission is simple: help West End residents get to work. We also will focus on change at the systems and structural level. These strategies better support youth and adults involved in the criminal justice system and overall public policies that perpetuate structural violence. The Center for Policy and Innovation (CPCI) seeks to address the social, political, and economic policies as well as root causes of structural violence through a collaborative model. CPCI’s mission is to advance equitable and inclusive policies through research, training, advocacy, mobilization, collaboration, and accountability for marginalized communities in Louisville. CPCI will utilize a racial equity tool to advance policies that positively impact these disenfranchised communities in a collaborative coordinated system; the core areas of activity – or pillars – of the center, will be Organizing and Mobilizing; Advocacy; and Research and Evaluation. The CPCI will be incubated within the Louisville Urban League and hiring process is underway for a research assistant. After the initial incubation of the project, the goal for the project is for it to be co-owned. CPCI will work to elevate the importance of policy and the role it plays in shaping humanity. Ensuring equitable ownership among stakeholders is imperative. Co-ownership mitigates power differentials that might exist among stakeholders, and it also increases the likelihood partners will contribute more of their respective organizational resources that support the Center’s shared mission. Social and cultural norms help create a climate in which violence is encouraged or inhibited and help maintain inequalities between groups in society. We’ve developed strategies that seek to address mental models or the assumptions and beliefs that shape our community norms and actions, specifically around Louisville neighborhoods. The UJIMA Experience: Any Louisvillian knows, almost instinctively, the boundary line between the West End and the rest of Louisville: Ninth Street. The notion the West End is a dangerous place is embedded in the mental models many of us carry around in our heads. Examine history, policies, and many other factors beyond individual choices that make generational prosperity less attainable for some. During our inaugural year, we will facilitate crucial conversations with groups to cultivate change and begin imagining a different kind of community – one where current policies and practices can be ‘amended.’ This will begin with history sharing through the presentation – Redlining Louisville: The History of Race, Class and Real Estate. As a result of the guided dialogue, we will (1) help individuals and organizations envision a future of more equitable policies and procedures, (2) provide specific opportunities for community engagement around change initiatives and (3) provide the evaluation needed to track change. Maryam Ahmed, Mayor’s Office for Safe and Healthy Neighborhoods; Sherman Brown, McCarthy Strategic Solutions; Shannon Cambron, Ed.D., Spalding University; Quaniqua Carthan, Cities United; Tiffany Cole Hall, Volunteers of America Mid-States; Katy DeFerrari, Ed.S., Jefferson County Public Schools; Kim Dodson, Independence Bank; Gary Dryden, Jefferson Community and Technical College; Steve Durham, Louisville Metro Department of Corrections; Heather Gibson, The Healing Place; Rob Givens, RPG Consulting; Abby Goodloe, Humana Inc.; Jessica Green, Louisville Metro Government; Jessie Halladay, Louisville Metro Police; Jill Horn, Brown-Forman Corporation; Ken Howard, Peace Education Co.; Philip Imber, LG&E and KU Energy; Trinidad Jackson, University of Louisville; Bridgette Johnson, New Directions Housing Corporation; Josh Judah, Louisville Metro Police Department; John Launius, Greater Louisville Inc.; Terra Leavell, Black Community Development Corporation; Joe Magana, Norton Healthcare; Barbara Menefee, Dinsmore & Shohl LLP; Libby Mills, Restorative Justice Louisville; Ebony O’Rea, Making Changes Together, LLC; Bill Oldham, Sr., Middleton Reutlinger, PSC; Mary Ann Palmer, Texas Roadhouse; Ferdinand Risco, Jr., Transit Authority of River City (TARC); J. Christopher Sanders, Chris Sanders Law PLLC; Savvy Kareem-Abdul Shabazz, Jefferson Community ; William E. Summers V, Republic Bank; Lyndsey Taylor, GE Appliances, a Haier company; Daryle Unseld, Jr., Metro United Way; Jeff Wafford, UPS; David Weathersby, Centerstone of Kentucky; Robert Webb, Frost Brown Todd LLC; Stacy Williams, GBBN Architects; Tom Williams, Stoll Keenon Odgen; Marita Willis, American Red Cross; and Walter Woods, Humana Foundation. Safety is the basic ingredient for urban prosperity. The costs of violence on a city are incalculable – both the real and perceived safety of the city of Louisville affects all citizens and the businesses that support our economy. As we seek to be the location of choice for our families, employers and new residents, we must dedicate attention and resources to ensure the highest quality of life in Louisville. Violence in any part of our city is a threat to prosperity everywhere. Far too many families and neighborhoods are grieving from the loss of life suffered from homicides, shootings, suicides and drug overdoses. For Louisville to be a safe, healthy, and vibrant city, we must strengthen our community’s ability to prevent violence and work to resolve underlying issues that lead to it. Community norms and actions can have tremendous impact in addressing the social and economic root causes of violence in cities. 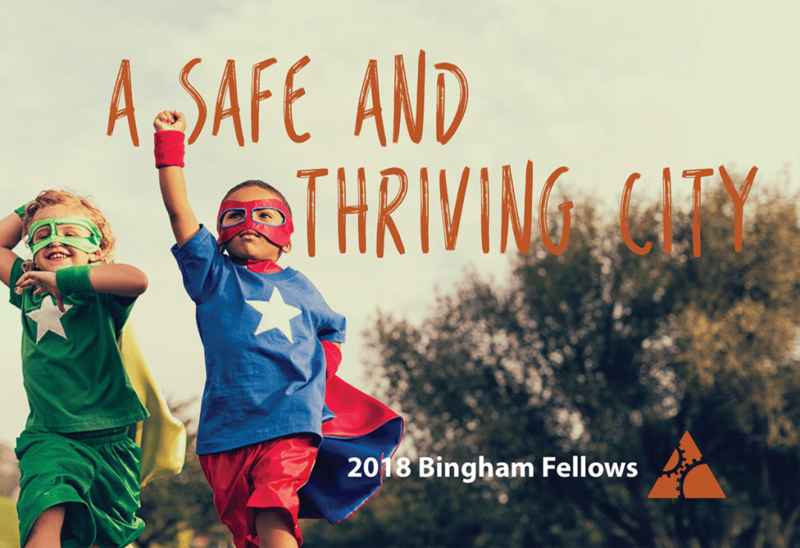 The Bingham Fellows Class of 2018 is made up of a talented group of local leaders with a broad knowledge base and range of experience on the topic. Beginning in January 2018, participants were asked to tap into their imagination and talent, gathering critical resources to create social change. They experienced an unmatched practicum in change management and group dynamics to move the needle on this important community issue. Throughout the program year, the class met with topic experts, learned from national best practices, and worked together to give this issue visibility and momentum for positive change. The Bingham Fellows program is the advanced leadership program of the Leadership Louisville Center. Created in 1988 through a $500,000 endowment from the Mary and Barry Bingham Sr. Fund, the Fellows are social entrepreneurs who have the imagination and talent needed to gather critical resources and create social change. Side by side with peers, participants work to develop dynamic and innovative solutions to our community’s most pressing challenges. Now graduating the 26th class, the Bingham Fellows have an impressive track record of providing community issues with visibility and momentum. The Fellows don’t ponder what might be. They roll up their sleeves, shine a spotlight on an issue and put new ideas to work. Their recent impact includes projects such as the West Louisville community development organization OneWest, regular Café Louie conversations with elected officials at Louisville Free Public Library locations, a sustainable model for neighborhood ‘Little Free Libraries,’ a talent attraction and retention program now managed by Greater Louisville Inc., and formation of the Kentucky Indiana Exchange, a regional leadership coalition. The impact of the Fellows goes back to the 1990s with the creation of The Housing Partnership, construction of the Presbyterian Community Center, growth of local farmers’ markets and numerous other positive outcomes. The Leadership Louisville Center is the region’s most valuable resource for leadership development and civic engagement. With a purpose to inspire and equip leaders to be better and do better, it has graduated over 10,000 through its civic programs since 1979. The Center is recognized as a national best practice and is known for its dynamic programming and strong community connections. Programming includes five civic programs (Leadership Louisville, Focus Louisville, Ignite Louisville, Bingham Fellows and Encore Louisville), leadership skills training courses presented through the Leadership Green Room, and events designed to motivate positive change. Learn more at www.leadershiplouisville.org.